under the small umbrella: VIVA RIVA! VIVA RIVA! 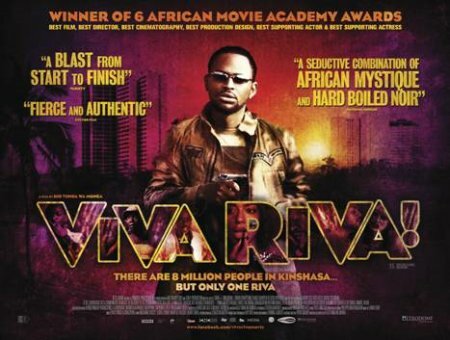 is a gangster thriller about a charismatic criminal, Riva, for whom a sudden burst of stolen wealth ignites an exhilarating, hedonistic and perilous journey through one of the most intriguing cities in Africa - Kinshasa. VIVA RIVA! expertly combines a fresh rhythm, violence and eroticism that promises to ignite a new wave of African cinema, whilst demonstrating the intelligence, wit and technical accomplishment of European cinema. The irony of the petrol thief Riva’s journey is that he lives in a nation widely recognised to be the richest on the planet in terms of untapped natural resources (in excess of $23 trillion), and yet the people of the Democratic Republic of Congo are amongst the poorest on the planet with the second lowest GDP per capita. VIVA RIVA! treats its audience to an imaginative portrait of vibrant rogues competing on the streets of Kinshasa. Trailblazing Congolese writer/director Djo Tunda Wa Munga mixes a heady cocktail of rich colour, dynamism and local music that marks him as an emerging force in World Cinema.